The DoD 8570 or DoD 8410 Directive are also known as the Information Assurance Workforce Improvement Program. The Department of Defense passed a regulation stating that all Information Assurance personnel must become compliant with the mandated IT and Security certification standards. There are levels of compliancy that parallel the individual’s job function. Infotec’s Government Team is here to guide our client’s to the best path to support their goals, while adhering to compliancy requirements, as well as, meeting the associated CE requirements along the way. 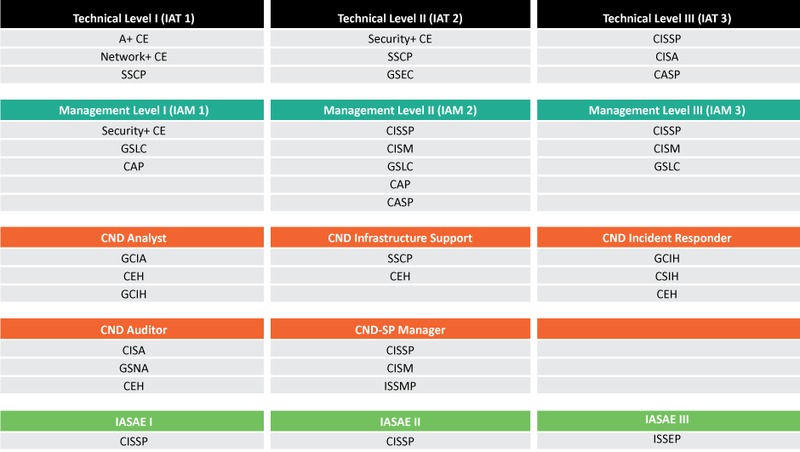 In addition to the baseline IA certification requirement, the DoD 8410 mandate states IATs with privileged access must obtain appropriate Computing Environment (CE) certifications for the operating system(s) and/or security related tools/devices they support as required by their employing organization. For example, Microsoft certification for Microsoft systems support technicians, Cisco certifications for Cisco technicians, or the specific system the IAT is spending most of his or her time supporting. This requirement ensures the individual can effectively apply IA requirements to their hardware and software systems.